I love eating green tea flavored desserts. Ice cream (!!! ), cake, mochi, macarons... almost anything! It's such a unique flavor that has a great balance of creamy, sweet, bitter, and herbal. Since green tea is one of my favorite flavors, I absolutely had to make some green tea macarons! I took these to a picnic for my church and they were definitely a popular flavor. Though making these are incredibly time consuming, they are worth trying out! Making macarons is a delicate process and they are a very finicky dessert, so don't be discouraged if they do not come out the first few times. Just keep trying! Practice makes perfect, and each time will be a new experience and story to share. 11. Before they dry, use a fine sifter to sprinkle some matcha powder or ground green tea leaves on one side of the shell. 1. Place white chocolate into a bowl. 2. In a separate, small bowl, place matcha powder and mix with about 1 tbsp of cream to create a paste. 3. Heat the remaining heavy cream until it boils. Mix in the paste until the powder is completely dissolved. 4. Pour the hot cream over the white chocolate. Gently stir until combined. 3. Pipe the ganache so that it is covering about 3/4 of the surface of the bottom of the shell. Enjoy and share these macarons with your closest friends, they will go fast! If you have any suggestions for future macaron flavors, post a comment! Love this! Green tea is one of my favs too - I just made match mochi for my husband for Valentine's Day and I've got a huge tub of green tea ice cream in the freezer right now. Definitely going to try these macarons. YAASSSSS THIS LOOKS AMAZING! I can't wait to try out your recipe next week! :) I've been wanting to make macarons for a while already. Thanks for sharing! I tried your recipe but my macarons came out lacking any green tea flavour. 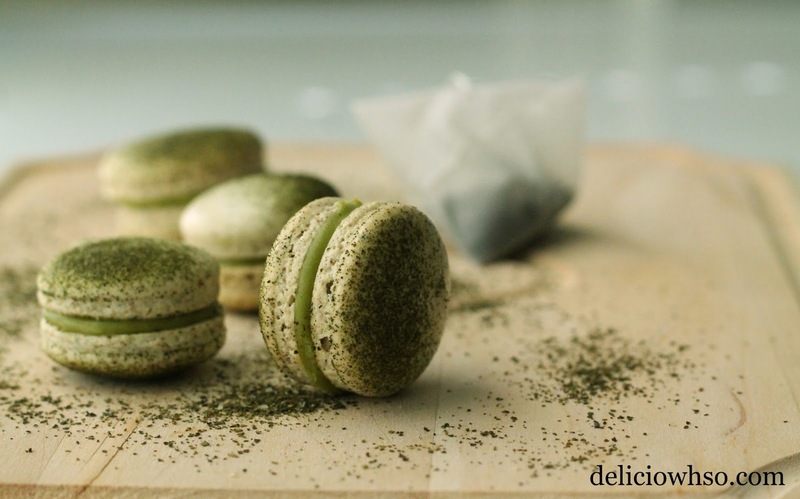 Do you have any tips for having a stronger green tea flavoured macaron? 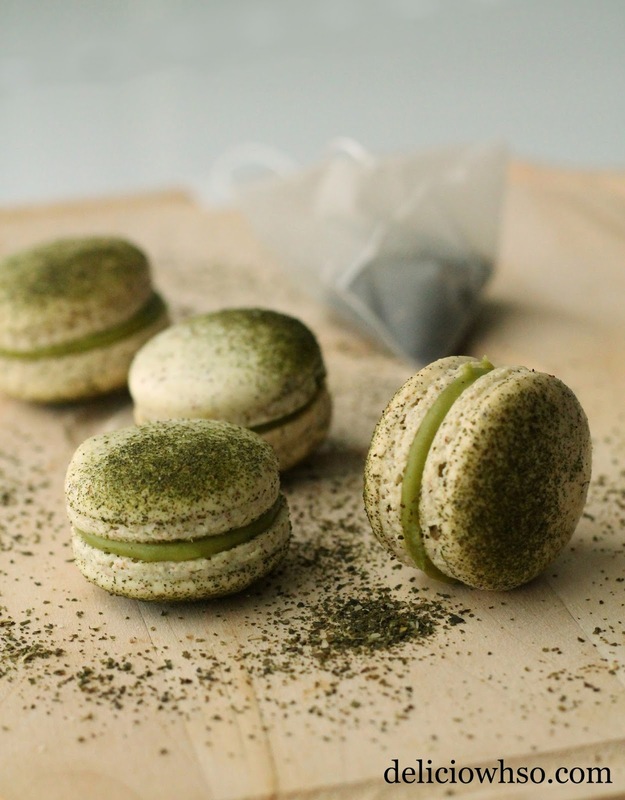 If you're using matcha powder, generally the flavor is pretty strong. The flavor should come primarily from the filling, so you can always add more matcha powder to the ganache. Using ground green tea leaves will leave a weak flavor. The type of matcha powder you use can also affect the strength of the flavor. Generally, Maeda En brand has a potent flavor. Other brands may require more. Good luck! On daily consumption of matcha green tea, you remain healthy and happy. The nutrients present in matcha tea include anti-oxidants, amino acids, vitamins, fiber, minerals and more. Thanks for sharing Send gifts to Pakistan .